The Homematic IP Temperature and Humidity Sensor is part of the Homematic IP smart home system and monitors the temperature and humidity in outdoor areas. The compact sensor detects temperatures between -40 °C and +85 °C degrees as well as relative humidity between 0 and 99 %. 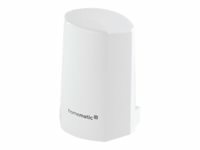 In connection with other Homematic IP devices, there is a large number of practical applications. For example, the sensor can be used for ventilation or de-humidification control, as frost monitor for heating sensible glasshouse plants as well as for numerous other scenarios. In addition, the detected weather data is displayed and evaluated in the Homematic IP app. Power is supplied by two LR6 batteries, offering energy for the sensor of up to five years. The required mounting material is supplied.